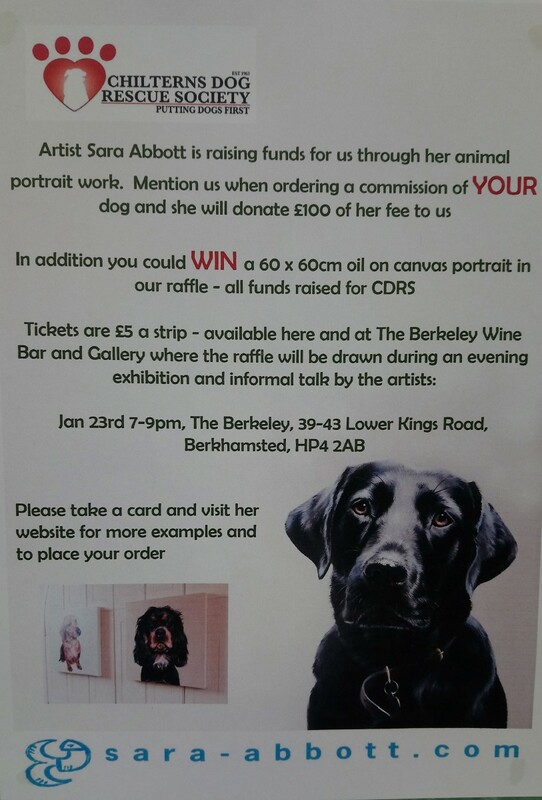 On Tuesday 23rd January Sara Abbott, a renowned artist, displayed some of her work at The Berkeley Wine Bar & Gallery in Berkhamsted to officially launch her collaboration with Chilterns Dog Rescue Society. During the first half of 2018 Sara will donate £100 to the Rescue Society for every Pet Portrait commission she receives. An official portrait painter for the Kennel Club and Harrods artists in residence for two years her work is recognised as among the best in the world today as even a quick glance will confirm. Abbott visits her clients nationally for a gentle photo shoot with her subject as she feels meeting the dogs and getting a feel for their nature and character is an important ingredient in her work. Her recent move to Berkhamsted means that she is now very local to us and why she has chosen to support our work. 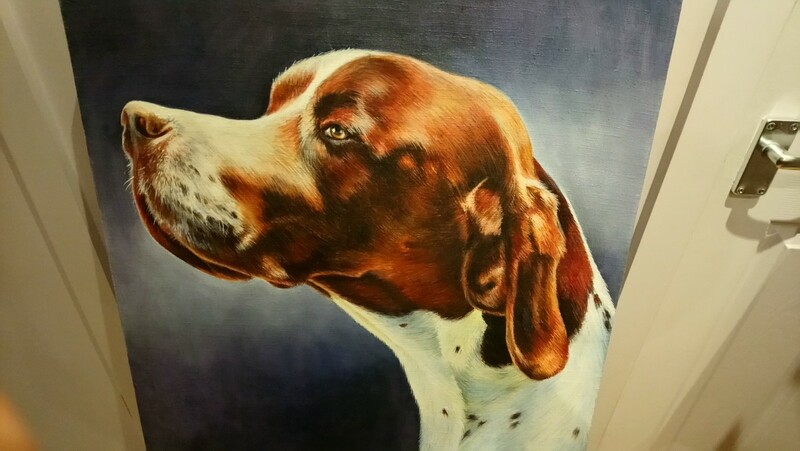 If you’ve ever thought about a portrait of your dog, as a gift for a loved one, a family heirloom or as a delicious self-indulgence now is the time to do it. Abbott’s work has featured in Elle Deco, Dogs Today, Hong Kong Tatler, Dogs Monthly, Beautiful Homes and many other publications and we can’t wait to see whose portraits she paints here in the Chilterns. Artist Sara Abbott is raising funds for us through her animal portrait work. 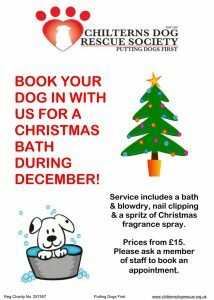 Mention us when ordering a commission of your dog and she will donate £100 of her fee to the Rescue Centre. In addition, you could WIN a 60 x 60cm oil on canvas portait in our raffle – all funds raised from this will go towards helping the dogs at CDRS. Tickets are £5 a strip – available here and at The Berkeley, Berkhamsted where the raffle will be drawn in an evening exhibition and informal talk by the artists on January 23rd 2018 from 6:30pm. SPECIAL APPEAL! DONATE TO DOGZONE! Moving into the new Rescue Centre was a huge milestone in the Society’s history. 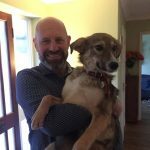 It is hard to explain how wonderful it is to see the dogs in their new kennels in an environment which helps to make their stay with us, for however long, as comfortable and fulfilling as possible. Of course, the kennels themselves formed Phase One in our vision to create a Centre of Excellence for our rescue and rehoming work. As we settle into our new surroundings we have already turned our attention to, and indeed commenced work on, Phase 2. This includes landscaping, car parking areas and the demolition of the old kennels to give us room for additional training facilities. As well as calm and comfortable surroundings in the kennels themselves it is also important to offer training, socialisation and relaxation areas for the dogs. Essentially a dog play zone! With this in mind, one of the key elements of Phase 2 will take the form of creating and building two enrichment and sensory paddocks. These paddocks will not only provide the dogs with the space to socialise together but by adding different plants, scents and textures as well as other features we can provide the mental and physical stimulation they also require. Features such as a sandpit for digging, water feature for paddling, log tunnels and raised platforms will enable dogs to put their natural skills to the test. Caves, trees and shrubs will provide additional interest as well as natural shade. Plants such as lavender, yarrow, St Johns Wort and valerian add scent and can offer beneficial properties for dogs. The paddocks can also be used to provide quieter surroundings for training as well as a good place for potential owners to meet a dog for the first time. In essence the paddocks will not only provide an exciting and stimulating area for the dogs but will highlight certain aspects of their personality, helping us to evaluate their progress and aid the rehoming process. Initial costings for two 25m paddocks plus the cost of the features is estimated to be £20,000 and to help us achieve this next chapter we are excited to announce the launch of a new campaign to raise funds to create our DogZone. It is because of your incredible generosity that we have already achieved so much and with your continued loyalty we can achieve so much more. My Favourite Voucher Codes – Vote Now! Raise money for dogs in need whilst saving on your online shopping – for free! This November, we are teaming up with My Favourite Voucher Codes in their charity poll, competing with two other charities to win 20% of their profits for the month. About My Favourite Voucher Codes: This online money saving website supplies discount codes and amazing offers for thousands of stores, from small online retailers to popular high street stores such as Argos and Debenhams. Online shoppers can enjoy up-to-date voucher codes on everything from stylish boots to beach holidays, and with such a wide range of stores to choose from, there is something for everyone. Alongside their codes, they give 20% of their monthly profits to a different charity each month via their charity poll, and in the last 5 years have given donations totalling over £50,000. Vote Online: Voting is both free and easy; simply visit the My Favourite Voucher Codes homepage and you will find the poll on the right-hand side (or the bottom of the page on mobile). Everyone can cast one vote, and once you do you can see how we are doing in the poll! There is no need to sign up or use any vouchers in order to vote, however every voucher used contributes to the final amount donated (whilst saving you money!). With this donation, we can continue to rescue and provide care for abandoned and unwanted dogs. With veterinary care, feed and training, it costs a great amount just to keep up the everyday running of the rescue. Vote today and help us not only continue helping the dogs in our care but also to rescue more dogs with uncertain futures and help them find a loving home. Another of our popular quiz nights in Wendover is coming soon on Saturday 14th October. Teams of 6. £12.50 per person. Hot supper included. Bring your own drinks and glasses. Contact cdrsevents@aol.com or 01296 623885 to reserve your table. We appreciate any donations of towels for the dogs in our care. Now we are in our new Rescue Centre we are using vet beds and no longer need blankets. We are also unable to use anything with stuffing eg duvets, cushions, pillows etc. We have moved into our new Rescue Centre ! I have always believed the redevelopment of the Rescue Centre would be the Society`s greatest challenge to date. That certainly proved to be the case. However, at long last, I am delighted to be able to say that Building Control have signed off the work and we have moved in. The new Rescue Centre is now open for business – what an amazing milestone this is for the Society. Our sincere thanks go to so many people over the years; their vision and hard work have got us to where we are now. Our members, staff, trustees and friends have shown an unwavering love of dogs and, by supporting our rescue and rehoming work, have demonstrated a deep commitment to help those in most need; we couldn’t be more grateful and hope you feel the new Centre fulfils all the promises we made to you at the beginning of this project. As you may remember, very rapid progress was seen in the early stages as the site was cleared, the ground works team moved in and the walls of the new buildings began to rise. Once weather proofed with a sophisticated roof design and windows, further work began inside in earnest. This was less obvious to visitors but included a network of integrated systems for heating, lighting, mains and ‘grey’ water provision and waste disposal, together with the installation of fire alarms, intruder alerts, resin finishes for the kennel walls and floors, tiling, decorating, office flooring, … the list went on and on. Last year we launched our Metre of Mesh campaign to raise £40,000 towards completion of the mesh work, one of the final stages in Phase 1 of the redevelopment. Again, thanks to the amazing generosity of members, the public and Support Adoption for Pets, we reached our target and instruction for the installation of the remaining mesh was given. We have also finalised other remaining items such as the disabled access and emergency exits in the past months. Further thanks go to our volunteers who have assisted us with so much of this additional work; Mike Ellis for making our trellis and planters, Paul and Ann for providing plants, Callum and Antony for assisting with landscaping, Joyce for moving over fund raising materials and dog records and many others. Some temporary landscaping has been put in place prior to moving onto Phase 2 which involves demolition of the old facilities, setting up training facilities and final landscaping – a condition of our planning permission. With all this effort, we have created a superb facility for housing the dogs (see the report From Rescue Centre for further details) and we have just transferred all the office and administrative aspects of the charity to the central hub to complete the relocation. This is not the end of the story. There is so much more we want to achieve for dogs in need and so, with your support, we will continue to help in whatever we can. Thank you to everybody who sent in ‘wintery’ pictures of their dogs. 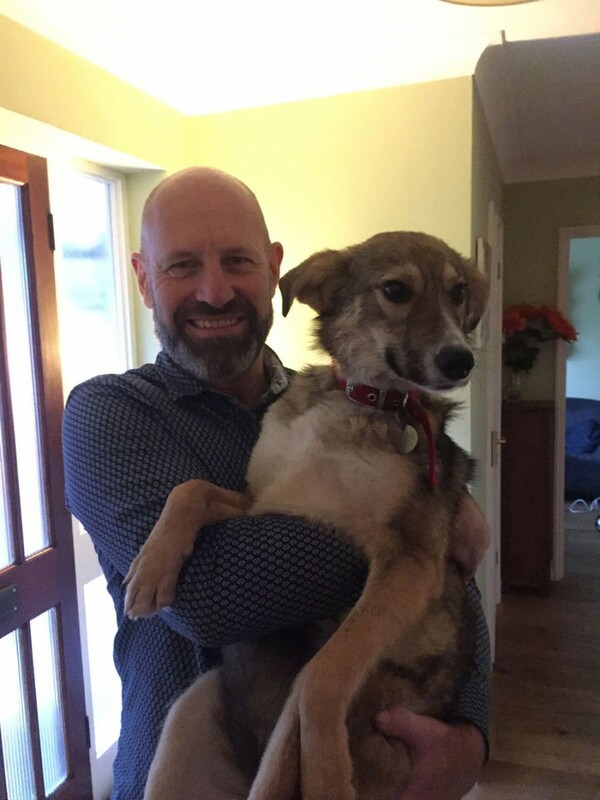 We have absolutely loved seeing our former dogs in their new homes; it makes all the hard work worthwhile to see the dogs looking so happy. We would like to take this opportunity to thank you for your continued support of the Rescue Centre and wish you a very Merry Christmas and a Happy New Year. 2017 is going to be a very exciting time. Metre of Mesh Campaign Success! We are delighted to be able to tell you that our Metre of Mesh Campaign was successful and we have now achieved our £40,000 target. We were able to raise £20,000 through fundraising and donations and £20,000 via a successful grant from Support Adoption for Pets. We want to thank everybody for their generosity and kindness; we could not have done it without you. The text donation number is now closed but you can still make donations in the usual way on our donations page via CAF Donate.